Whether you are looking for property very close to the city or out in the middle of nowhere - an MyOwnArizona™ Horse Property Specialist will be able to find the horse property you are looking for in Arizona. 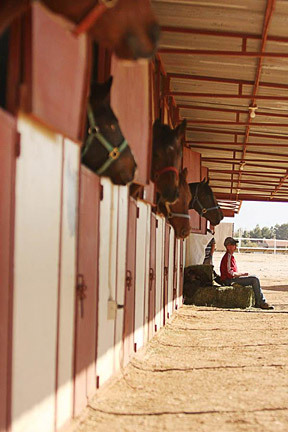 Horse properties and equestrian homes can still be located in several areas throughout greater Arizona. Although the vast horse ranches of the past have yielded to the rapid growth of new home developments, scattered pockets of horse properties remain. While fast-paced urban neighborhoods surround most horse properties, a few communities adjoin large parcels of state-owned land that allow riding in the beautiful Sonoran Desert. Arizona equestrian real estate offers a unique lifestyle within the city. 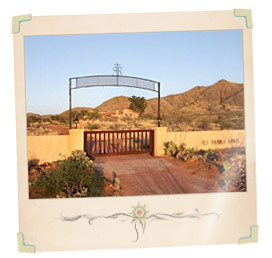 Tucson features homes with large lots that can accommodate horses, and many of the homes have corrals. Some people without horses purchase homes in this great Tucson horse community for the larger-than-usual lot size and the rural feel of the neighborhood in a great Southern Arizona location. A park and dry riverbed throughout the city very close by also allows horseback riding. In Tucson, Marana, Oro Valley and Green Valley large parcels of rural ranch land can still be found in Arizona, which has many miles of trails to explore. New development is threatening the remaining horse property real estate in many areas. So it is important to get the land that would be right for you now. 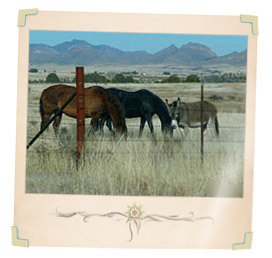 The cities in the Arizona area offer a broader selection of horse properties. Many have communities with a large selection of new and resale homes, lots and properties on acreage that will accommodate horses. Outside of Tucson, a rural area with many horse properties and riding trails that meander through the hills and mountains of the Sonoran Desert. Arizona, where an abundance of horse property real estate can be found with access to nearby riding trails in the Catalina Mountains. Arizona is growing fast yet retain ample land for horses. Let your area MyOwnArizona™ Horse Property Specialist do the legwork for you. Special News: Rillito Tucson Horse Racing History, and its place in racing.. The Rillito Tucson Horse Racetrack is designated with an American Quarter Horse Foundation Historical Marker that provides official acknowledgement of horses, people and events significant to American Quarter Horse history. In the 1930s, as the University of Arizona was developing, two university students who were also horsemen, Ruken Jelks and Mel Haskell, decided to upgrade the supply and quality of racing quarter horses in Tucson and started a breeding program of their own. Eventually they needed a place to race the horses they bred, so Jelks, with the help of Mel, carved a track out of desert land in Jelk's backyard on River Road. Bob Locke, a local racing expert, and Jake Meyer, a man with starter experience, joined the team and Rillito Tucson Horse Racetrack was off. Rillito Tucson Horse Racetrack was the first regulated racing quarter horse facility in the United States. It set standards still in use today, among them the chute system, the photo finish, and standardization of races. Haskell's record-keeping during the first season of Rillito Tucson Horse Racing led to the establishment of the American Quarter Horse Racing Association in 1945. Because of his efforts, he was recognized as the "father of modern Quarter Horse racing" and inducted into the American Quarter Horse Race Association Hall of Fame. Many famous horses have passed through the starting gates of Rillito Tucson Horse Racing Park, among them world-famous sprinters such as Shue Fly, Joe Reed II, Piggin String, Hard Twist, Queenie and Miss Panama. Most recently, Rillito Tucson Horse Racing Park has been the fertile training ground for new legends in the racing industry, including Bob Baffert, the trainer whose horses have won two legs of the Triple Crown including the Kentucky Derby four times; Todd Pletcher, a leading trainer whose horses have consistently placed in the Triple Crown and won numerous stakes races; and Joe Badilla, a four-time world champion jockey. We spend a lot of time out in the local horse properties and equestrian real estate communities getting to know every in and out of each neighborhood and the Tucson horse properties and equestrian real estate market in general. So whether you're relocating to Tucson from out-of-state, just moving from another Arizona city to Tucson, investing in a winter or second home, upsizing or downsizing, or just wanting your dream home on the 18th hole, MyOwnArizona™ Team has the experience and insider know-how to get you and your family settled in no time. Contact us at: info@MyOwnArizona.com for Tucson & Arizona horse properties and equestrian real estate.